Bankruptcy Lawyers in Shelton Washington ready to represent you! Bankruptcy may seem like a drastic measure, but sometimes it's your only choice. Considering bankruptcy is not something you do overnight or easily. But based on our experience there is a huge weight lifted off your shoulders when you realize there are no more creditors calling you daily. Stop All Collection Efforts Immediately. Federal law has something called the "Automatic Stay" which prevents any creditors from contacting you in an attempt to collect any debts. It also stops foreclosures, lawsuits, and threats of garnishing wages. This is designed to help people that have accumulated so much debt, that it would be impossible to repay it all with their current income. At the Free Attorney Consultation, our experienced attorneys will go over your finances and explain your options to you. You may qualify for a Chapter 7 Bankruptcy, in which most of your unsecured debt like credit cards, medical bills, repos, etc. will be permanently discharged, and this will stop lawsuits and garnishments. If you have disposable income after paying for your regular monthly expenses, you may qualify for a Chapter 13 Bankruptcy Plan, where you can save your house from foreclosure, stop the IRS, and still discharge most, if not all, unsecured debts like a Chapter 7 does. A Chapter 13 usually requires monthly payments for 3 to 5 years, but these are based on your budget. Attorney Erin M. Lane has had hundreds of cases where clients had more debt than they could handle. When you think about the amount of experience that carries, you should feel comforted your case will be handled with care and professionalism. Filing for bankruptcy can seem like a scary process, but our experienced attorneys and staff will guide you through the process, and our clients often comment to us how easy it turned out to be. Especially when you have grown used to dealing with debt collectors calling at dinner or at work. Trust our attorneys to deliver the best service to liberate your family from crushing debt. Another very important reason to hire an attorney to file bankruptcy on your behalf, is that the "Automatic Stay" benefits won't go into effect until you actually have filed for bankruptcy. If you inform the debt collectors you have retained legal counsel, they will most likely stop all efforts. But keep in mind they are not required by law to do so until you have filed for bankruptcy in the courts. Shelton Bankruptcy Lawyer Erin M. Lane has helped hundreds of Washington State residents dealing with unbearable amounts of debt. 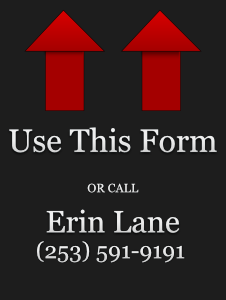 Call him directly or use the form to your right at any time.